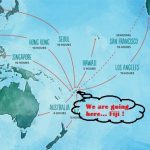 Global Underwater Explorer’s (GUE) Project Baseline (PB) Fiji 2017: Mission – The First Four Days! 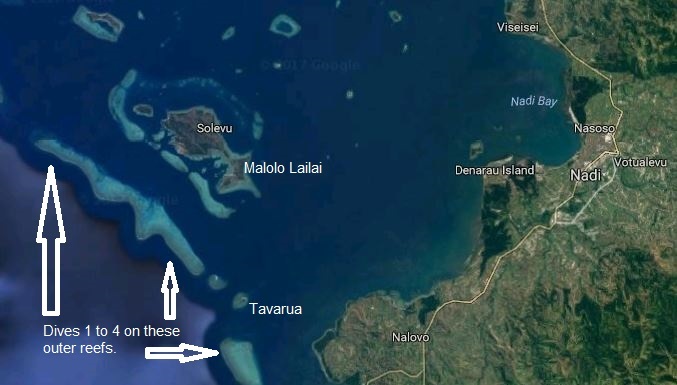 As you can imagine, we landed in Nadi, Fiji at 6am, Sunday, 14 May (remember we left at 6:30pm Friday 12 May: time travel is possible) and hit the ground running; 5 of us out of Reno, 3 from Florida, 1 from Seattle (the Tech Dive NZ [New Zealand] crew of 4 arrived on Saturday) and 20 plus bags shuttled to the marina in two transport vans; all PB team from USA and bags 100% intact. We were greeted by the crew of the m/y (motor yacht) Ad-Vantage, loaded in all our gear and began to sort everything out. 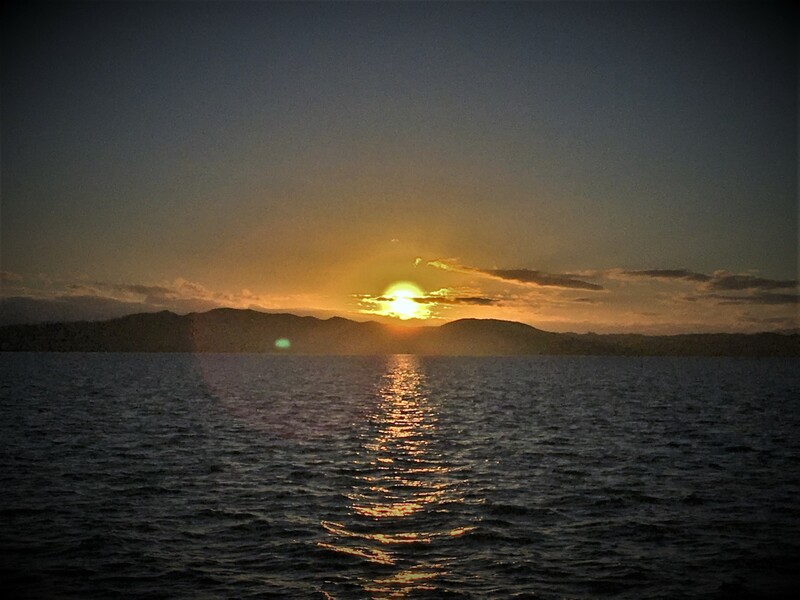 By 10am, the ship was headed out to our anchorage for the evening off an island just to the west of Nadi on Fiji mainland’s western coast; Malolo Lailai. Continuing to sort our gear well into the evening and prepare it for our first underwater adventure Monday, 15 May was our first mission task and as you can envision, it went late! Before I begin with the mission to date specifics, I first have to acknowledge the Ad-Vantage Crew and the Tech Dive NZ crew. The Ad-Vantage crew (Captain Pedro, Randall, Ben, Jessie, Xavier, Ed, Robin, Barry, Marvin, Freya and Lisa are truly second to none. This “Super Yacht” operation is normally recreational in nature; groups wanting to experience Fiji on vacation in a very spectacular way. Now, we throw at them a “commercial” research expedition and they did not miss a step. The ship holds three tender vessels and a Triton 3-person submarine that can visit depths up to1000m/3300’ and each day, using the 50 ton crane on board, they lift the tender boats in and out, prepare us three delicious meals, cater to every need we have with a smile, working extra hours with never a complaint and then get up the next day and do it again. Now I have no idea what a vacation like this would cost but I would guess about $20-$25 grand per day! We have a dedicated transport tender, a dive boat and sub-op boat, the sub…it is incredible and they are incredible! If you have the means, I definitely recommend you contact this group for your next or even your first Fiji vacation!!! Now the next group that has made this expedition possible is the outstanding group of New Zealand residents representing Tech Dive NZ, Mel Jeavons (Co-Owner of Tech Dive NZ with her husband-Jamie Obern), Jamie Obern , Russel Hughes, both GUE Instructors and Rob Wilson (GUE diver, Frontline Photography and Ghost Fishing NZ). This fantastic bunch of “Kiwi’s” got all our tanks, scooters, sofnolime, filling equipment, oxygen and other critical equipment here to Fiji from NZ. About 1500 lbs of gear not including their 1000 lbs of personal gear; to put this in perspective, had they not, we would have incurred about $6000 of excess baggage fees. On top of that, we still would have had to figure out so many other logistics that this mission would not have been possible. They truly made it happen. Add to this, Russel and Rob are filling our tanks daily, supporting the Scientist dives and dive-mastering our rebreather dives! Simply professional, dedicated…a incredible pleasure to work, dive and build a lifelong friendship with! I cannot speak highly enough of each one of these guys individually…THANKS! So our daily goal is to execute three dive missions daily. 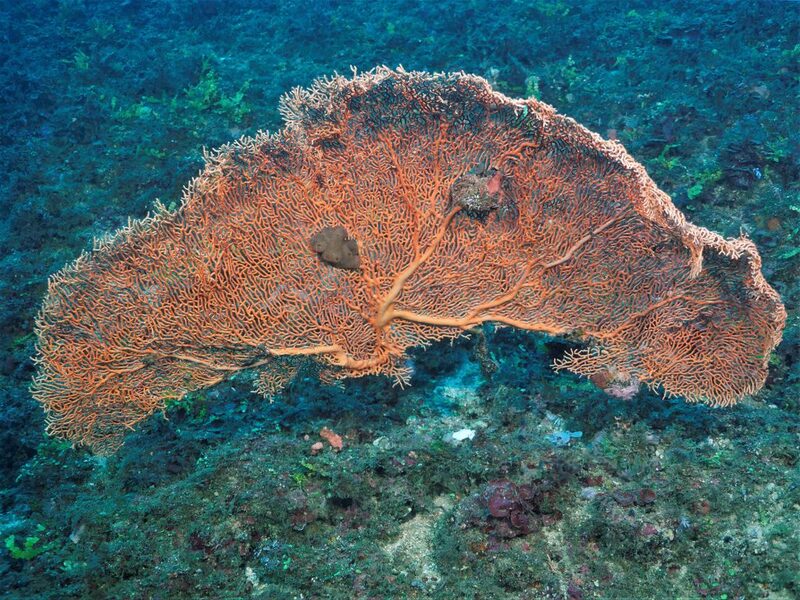 1) Scientist SCUBA dives; really… professional, PHD, highly educated, onboard scientists – Brian Walker and Charles Messing from Nova Southeastern in Florida and Cero Rico from the University of the South Pacific. 2) a Submarine Dive taking a variety of people to the depths; scientists, dignitaries, students. 3) GUE, JJ rebreather (CCR) dives lasting from 3 to 5 hours. So you do not fall asleep, I will focus only upon the Missions CCR dives. However, should you wish, I have included links at the end of this Blog so you can read and see more about this exciting Mission. The daily CCR dives will descend to 120’/36m and spend about 60 to 90 minutes executing tasks, then we will move up to 65’/20m, spend about 60-90 minutes there and then finish our dive at 30’/10m for another 60-90 minutes finishing our daily dive objectives. The first two cameras, you read about during my Bermuda Blog (which is now on the our website) at each depth is to film 8, 50m (165’) stereo video “Fish Transects” (forward looking video). This allows the Scientists to see a 3-D image of the various fish we encounter, record and evaluate. 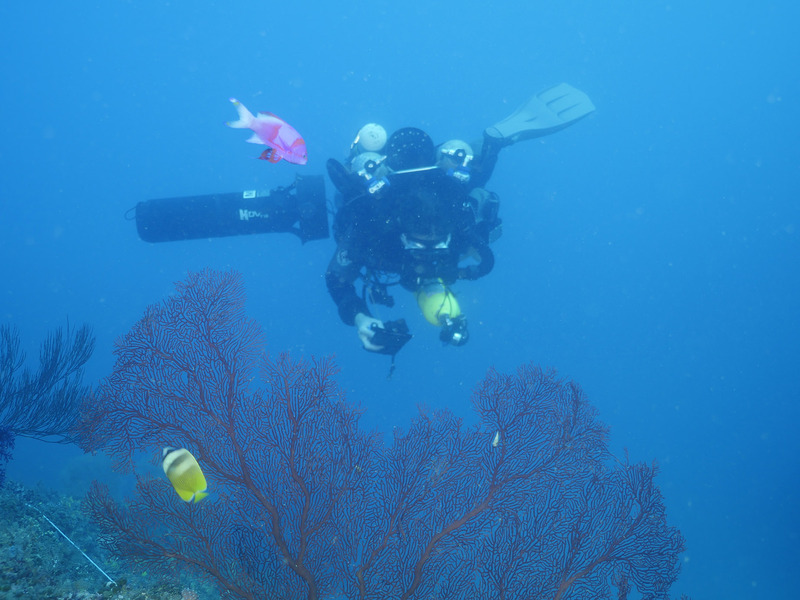 The third camera is to film 8, 50m (165’) “Benthic Transects” (bottom looking video) looking at the corals, algaes, rocks, substrate, so that again the scientists can see what is there in a laboratory environment and assess the health of the reef. Camera four, films a variety of images along the 4 cardinal compass points at the starting point of each transect and functions as one of our prime Project Baseline goals to create a photo database of “reproducible” images at known locations so that we can return in the future, take the same photo at the same location (GPS tagged) and compare the images for improvement or deterioration. The fifth camera, our new “high quality” camera system to film all the divers doing this work together and scenic images. Now we are not at this point yet; you do not jump in on a dive like this and accomplish all your dive objectives on dive one; each mission is different and with a whole new team of divers. We begin by building our underwater team. Dive 1, of course was simply a shakeout dive; create team responsibilities, check cameras (which just about all did not work as expected – so we fix that), practice individually assigned tasks, figure out how to manage all the cameras, safety tanks, scooters, tow-fish and line (the surface marker we tow so the boat knows where we are at! ), etc. Dives 2-3-4 we built our accomplishments from the foundational experiences and knowledge built from the previous dives and now, as we sit on the eve of Dive 5 at Kadavu. 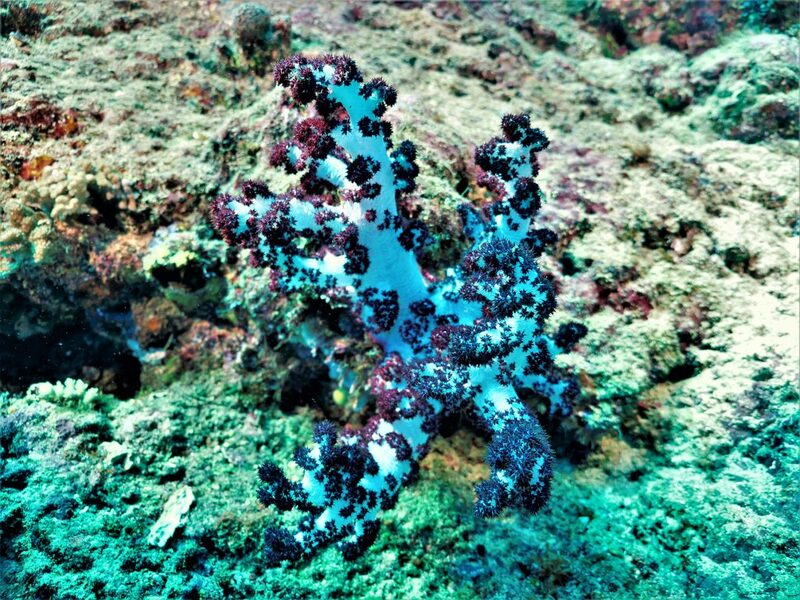 Our first 4 dives were conducted on the outer barrier reefs just west of Nadi between the islands of Malolo Lailai and Tavarua. My first impression, sad! The reef from 65’/20m up was gorgeous but below this depth, dying and at 35 meters / 120 feet, dead and overtaken by algae. Now this is only one part of this island chain but still…you think of the South Pacific as this pristine, sparsely populated and environmentally impacted area but the truth is, what is going on in the world, does radiate here into a potentially negative environmental impact. I sign-off – (I know you are relieved ?) – from Blog 2 saying that… Blog 3 will be full of more incredible culture, diving, teamwork, human interest, crew dynamics and mission success in helping the Fijian Government understand its underwater world and build a baseline representation of the present conditions that lie below its beautiful blue waters so that impactfully positive environmental decisions can be made going forward. Thanks for reading! Please SHARE this with everyone you know! The more eyes on our “volunteer” work with Project Baseline’s Global Missions, the better we can help preserve our Earth’s natural beauty. A “Sea Fan” – type of hard coral at 120’ / 35m – surrounded by algae – not good! 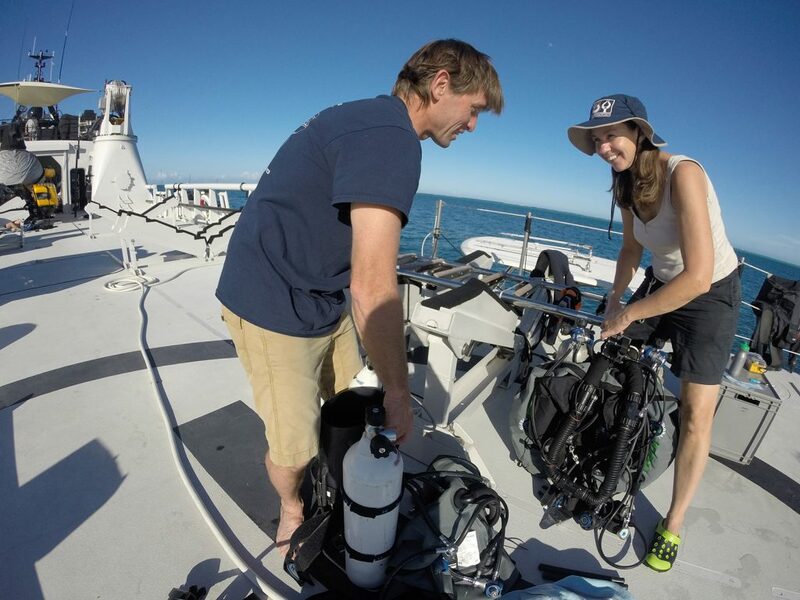 Rebreather team divers, Todd Kincaid & Mel Jeavons, prepping JJ CCR’s for a dive.